The Salzburg University of Applied Sciences is located in the sourrounding of Salzburg, Austria, one of the worlds most beautiful and famous baroque cities. The city is shaped by the Salzach river and the city‘s hills such as the Kapuzinerberg and the Mönchsberg. 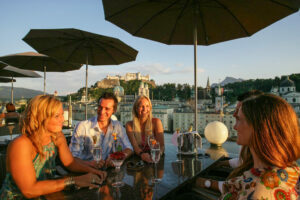 Salzburg is world-famous for its beauty and its cultural diversity. Wolfgang Amadeus Mozart, the Salzburg Festival, the baroque old town, the spirit of the Sound of Music and numerous famous visitors and residents, have all contributed to Salzburg’s profile on the world stage. The city is, and always has been, a talismanic place for music lovers, romantics and connoisseurs. Nor has the city lost any of its congeniality over the years. On the contrary, tradition is accompanied by modern points of contrast, creating a fascinating combination in both the city’s architecture and cultural offerings.